Students discuss the Holocaust exhibit with Wendy Campbell, Youth Service’s Librarian, (right) in the Bitterroot Public Library. One of the exhibits around the Bitterroot Public Library was from the Holocaust Interactive Exhibit a traveling teaching trunk for student education. Detailed documents, photographs and communications were in the Holocaust Interactive Exhibit ““Teaching Trunks” at the Bitterroot Public Library. Through discussion and touring a physical exhibit that included old photographs, citizenship papers, maps and items of clothing, students were able to gain an understanding of a piece of history belonging to the era of their great grandparents. The program, which arrived in two “Teaching Trunks” from the Illinois Holocaust Museum and Education Center in Skokie, Illinois near Chicago, included an exhibit in the lower level hallways of the library. The hallway walls were lined with personal stories of victims and survivors, large maps for reference and personal accounts of children and their families with physical "artifacts," such as a small girl’s knitted, red dress. Students participated in a group discussion then formed small groups to examine and discuss exhibit artifacts. Exhibition of the program was organized by BPL Youth Services Librarian, Wendy Campbell, who heard of the travelling exhibit through the Montana State Library. The trunks, which looked like old time trunks with straps, locks and handles, were provided to the library free of charge including no shipping fees. Darby High School participated in the high school trunk, titled “Holocaust: Investigating Human Behavior,” in February. This trunk focused on categorizing behaviors of individuals and groups including perpetrators, collaborators, resisters, rescuers, victims, upstanders and bystanders. “All of (these) are behaviors that we exhibit every day based on the choices we make,” Campbell said. 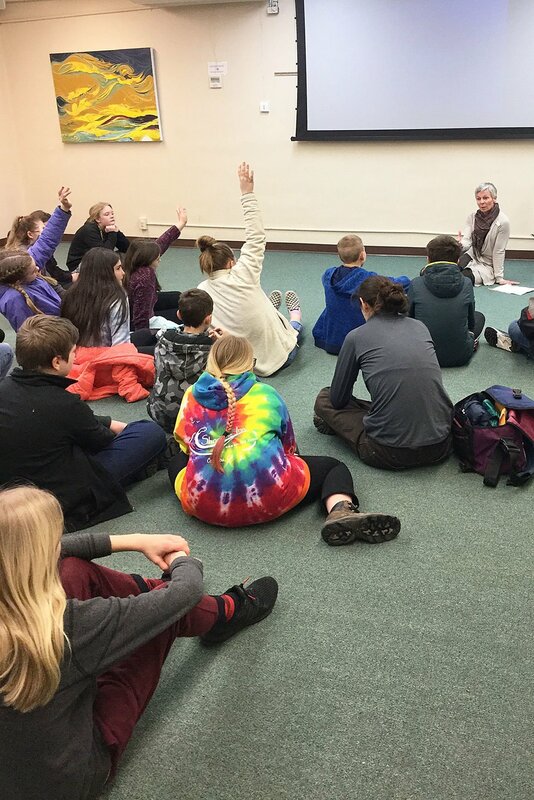 Hamilton Middle School and Corvallis Middle School participated in the middle school trunk, titled “Holocaust: Memory, History and Culture.” Two local private schools also participated in middle school trunk activities. The focus for this age group was on memory, history and culture emphasizing individual rights and the choices people make. As they toured the exhibit, students partnered to answer questions about each exhibit piece. According to Campbell, the students were engaged and appreciative of the opportunity these educational trunks provided. Many expressed surprise at the positive actions of individuals and the heroism of groups of people, she said. Campbell hopes to borrow a different trunk from the museum next year. Campbell has been Youth Service’s librarian at BPL since December 2017 and the former director of Darby Community Public Library.